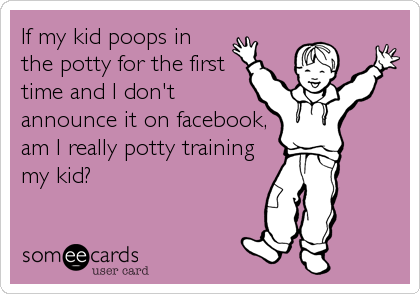 When I had my first kid, I read that you should let your kids watch you go potty to help them learn. I thought, whew. All those times I haven't been able to use the bathroom by myself were actually unknowingly strategic instead of just kind of annoying. In hindsight, I don't think it really helped. I didn't realize it until my second kid came along and she had the chance to also watch an older toddler use the bathroom. It was way more effective. So I realized, I was modeling going potty all wrong. I must have just looked like I sometimes like to sit on the toilet and chill, just like I sometimes like to sit on the couch. Now I know better. Step one: let your kid watch you go to the bathroom, but potty like a toddler and let them know you are doing something. First, look like you're concentrating, then straining, then maybe grunt. Finally, hop up and admire your work. Keep in mind, this is entirely conjecture and I have no proof that it will work, but it is one of those things where even if you lose, you win. If your kid doesn't get any benefit, you at least have a couple years of amazing memories of you making a fool of yourself while peeing with a child audience. Step two: give your Facebook friends a blow by blow of your potty training efforts. The one thing that social networking is really missing out on is the real life, up close and personal, human element. In other words, poop. Let us know about your kid's poop. And don't stop there, let us know when you poop. Because, high five! You're a big kid too! There you have it. Go ahead and cancel your amazon subscription to diapers. You're welcome. Update: some actual, for real potty training tips: lots of naked time or big kid undies time (most diapers don't let them really feel that they peed), with frequent (every thirty minutes or so) chances to sit on the potty and try to use it. If they have an accident, put them on the potty right away so they can associate the two. every time they poop or pee, label it. act like the whole potty thing is really exciting and fun so and grown up (instead of messy and laundry-filled and not really much more convenient than diapers).